‘Cardinal George wanted it finished on his watch,’ said John O’Malley, special counsel to the archbishop for misconduct issues reports the Mail Online O’Malley said George didn’t want Bishop Blase Cupich to have to deal with the issue when he assumes leadership of the nation’s third largest archdiocese later this month. ABC news continues:- A report provided by the archdiocese to The Associated Press and other media this week suggested that the documents released Thursday would be similar to those made public in January. Those records described how the archdiocese hid the histories of abusive priests moving between parishes, did not swiftly remove the men from the priesthood, and in some cases helped them remain priests for years after allegations against them were deemed credible. In one case, for example, a priest who was removed from the ministry after admitting to sexually molesting two boys 19 years earlier was reinstated in 1995 under a set of strict guidelines by then-Cardinal Joseph Bernardin. Bernardin said the priest, John Calicott, posed “no significant risk to children” if he continued therapy. 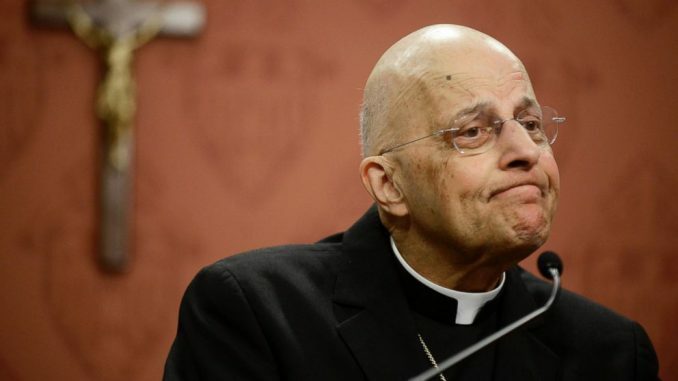 In 2002, George removed Calicott and several other priests after Catholic bishops called for the removal from ministry of any priest against whom an abuse allegation had been substantiated. The records cover more than 350 incidents of abuse since 1952. The vast majority happened when the late Cardinals John Cody and Bernardin headed the archdiocese. George took the helm in 1997. Some files include letters of support for accused priests, a reminder that these allegations came at a time when both the public and the archdiocese had difficulty believing that these trusted parish leaders could be sexually abusing children. Not included among the documents are allegations against former priest Daniel McCormack, whose case could have shed light on how George handled suspected abuse. McCormack pleaded guilty in 2007 to abusing five children and his case prompted an internal investigation of how the archdiocese responds to abuse claims and an apology from George. O’Malley said the archdiocese is prohibited by law from releasing McCormack’s file because there remains pending civil litigation. Although O’Malley outlined a host of initiatives that the archdiocese has launched to protect children and aggressively investigate abusive priests, critics say the omission of McCormack’s file raises questions about whether the archdiocese is doing enough. Is McDonald’s Giving Us The Illusion Of Caring With Their Latest Menu Improvement?